The tidal dynamics in a pristine, mesotidal (>2 m range), marsh-dominated estuary are examined using moored and moving vessel field observations. Analysis focuses on the structure of the M 2 tide that accounts for approximately 80% of the observed tidal energy, and indicates a transition in character from a near standing wave on the continental shelf to a more progressive wave within the estuary. A slight maximum in water level (WL) occurs in the estuary 10–20 km from the mouth. M 2 WL amplitude decreases at 0.015 m/km landward of this point, implying head of tide approximately 75 km from the mouth. In contrast, tidal currents in the main channel 25 km inland are twice those at the estuary mouth. Analysis suggests the tidal character is consistent with a strongly convergent estuarine geometry controlling the tidal response in the estuary. First harmonic (M 4) current amplitude follows the M 2 WL distribution, peaking at mid-estuary, whereas M 4 WL is greatest farther inland. The major axis current amplitude is strongly influenced by local bathymetry and topography. On most bends a momentum core shifts from the inside to outside of the bend moving seaward, similar to that seen in unidirectional river flow but with point bars shifted seaward of the bends. Dissipation rate estimates, based on changes in energy flux, are 0.18–1.65 W m−2 or 40–175 μW kg–1. A strong (0.1 m/s), depth-averaged residual flow is produced at the bends, which resembles flow around headlands, forming counter-rotating eddies that meet at the apex of the bends. A large sub-basin in the estuary exhibits remarkably different tidal characteristics and may be resonant at a harmonic of the M 2 tide. We wish to thank several people who made indispensable contributions to this study. Julie Amft, Cheryl Burden Ross, Trent Moore, and Guoqing Lin played critical roles in the design, planning, and execution of the field program; it could not have happened without them. 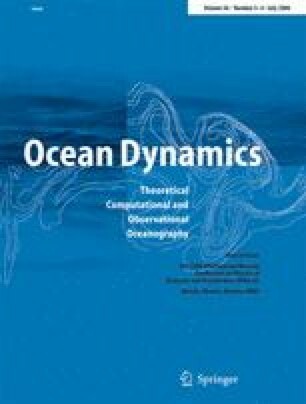 Anna Boyette at Skidaway Institute of Oceanography contributed to the preparation of the figures. The crew of the R/V BLUE FIN (Captain Jay Fripp, Raymond Sweatte, and Mike Richter) of the Skidaway Institute of Oceanography gave us dedicated enthusiasm and support in carrying out the field experiments. We also thank two anonymous reviewers for their thoughtful comments. We gratefully acknowledge the following agencies who supported the work described in this paper: the Georgia Coastal Zone Management Program (Grant No. RR100-279/9262764), National Science Foundation (LMER Grant No. DEB-9412089 and LTER Grant No. OCE-9982133), NOAA Coastal Ocean Program (Grant to South Carolina Sea Grant Consortium entitled “Tidal Circulation and Salt Transport in a Tidal Creek–Salt Marsh Complex”), and the Office of Naval Research (the SEACOOS program, N00014-02-1-0972).